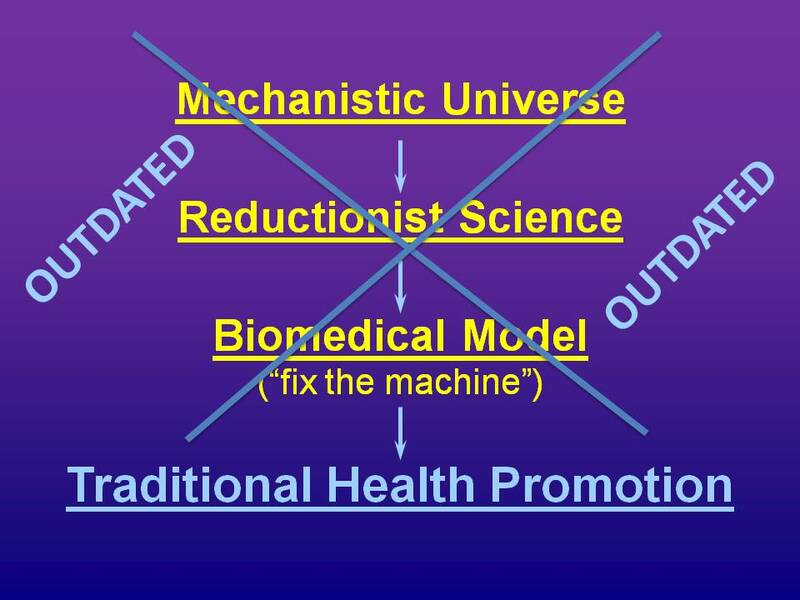 In the first part of this 3-part series, we traced the roots of our traditional approach to health promotion and health promotion at the workplace as they evolved out of the 17th century worldview of the Scientific Revolution according to which: 1) the Universe and everything in it are conceptualized as machines; 2) understanding these machines can only be accomplished by analyzing them (reducing them to their constituent parts); and 3) a biomedical (fix the machine) model explains what we need to know about health. We also mentioned that this worldview held the values of competition, aggression and especially control in very high regard. 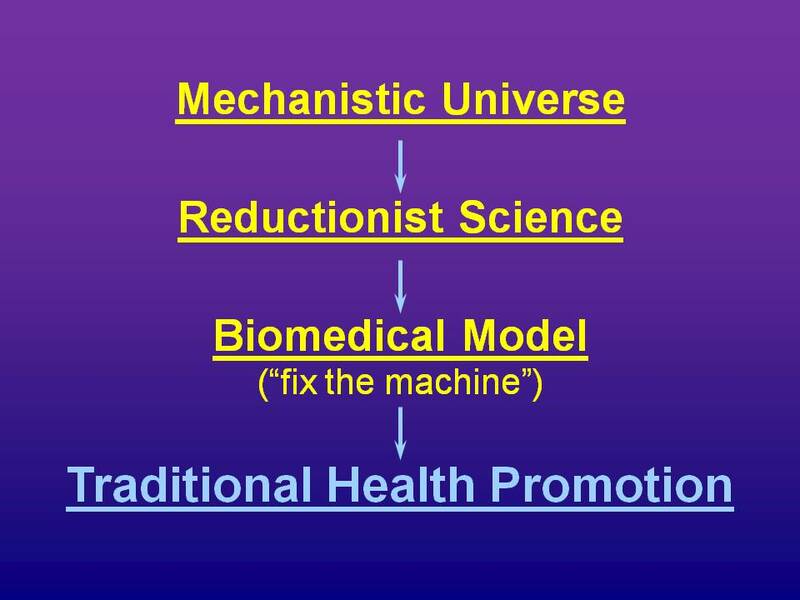 It is important to understand that it makes perfect sense that this is the approach to health promotion that emerged from The Mechanistic worldview and the Biomedical Model. The problem is that this 400 plus-year-old worldview is outdated, leaving us with an understanding and an approach to health that is similarly lacking. For instance, we now know that the two separate universes envisioned in the Mechanistic Worldview are, in fact, one; what happens in the mind is inextricably interconnected with what happens in the body and vice versa. We only have to examine the rich literature on placebo and nocebo phenomenon to know this to be true. (See Part I, Part II, and Part III of my series of blog posts on placebo and nocebo.) Furthermore, the idea that we can make people healthier by scaring and shaming them is simply not supported by the literature – certainly the dismal failure of weight loss interventions is the ultimate testament to that. Then there is the use of externally applied behavior change techniques to coerce people into doing what they don’t necessarily want to do. I mentioned the originator of these techniques—B.F. Skinner—in a previous post. The application of Skinnerian behavior modification in the form of contingent incentives to get people to change is ubiquitous in our culture; from grades in school, to bribing kids to eat their broccoli by promising them ice cream, to rewarding productivity at the work site. As for health promotion; rewards, incentives, contracts, contests and competitions continue to be at the core of the vast majority of programs. Ironically, though the Skinnerian approach to motivation is rarely questioned, decades of research substantiates that rewarding people in this manner retards learning, suppresses creativity, inhibits productivity and reduces internal motivation. (see Alfie Kohn, Punished by Rewards). So, there we have it. We can now go back to Joanna’s original comments concerning her fears about focusing on health (not just weight) at the workplace. She asked, “does anyone really think that governments and employers, in our deeply healthiest culture, will not abuse the power given them?” Well, I think it is a good question, and the answer, in my opinion is that we should not assume the power will not be abused. In fact, I would argue that it has been and is being abused. Here, for example, is a short list of really, really creepy things organizations are doing in the name of wellness. So, Joanna’s fears are well founded and the slippery slope is ever more slippery as organizations get more and more into the business of “getting” people to be healthy. Not a pretty picture indeed. In the 3rd and final part of this series, I will propose an alternative holistic, relationship-based approach for promoting health at the workplace. It seems to me you’re focusing on the wrong problem here. The solution is to stop healthcare being the employer’s responsibility altogether. You can’t blame employers for wanting to discriminate against smokers if those smokers are going to drive up the cost of business. If they have to pay punitive healthcare costs, it’s in their best economic interests to start behaving like health fascists. If there was a decent healthcare system, it would cease to be something they worried about. The thing is: what “we know” about health changes over time. I am old enough to remember when my pediatrician suggested that I might be guilty of child neglect for “forcing” a child to eat a “dangerous fad” diet, which was: a vegetarian health food diet (considered a “dangerous”, “fad” diet in the 1970s). What was then considered to be a “dangerous fad” diet is almost exactly the same way of eating that is now considered to be a “heart healthy” diet. So let me see …. if my EMPLOYER had forced or coerced me to adopt more allegedly “healthy” and “non-fad” eating habits (back then), say, by requiring that I serve meat and potatos 7x/week and requiring that I serve eggs and bacon instead of granola for breakfast every day in order to avoid a $5000 deductible on my health insurance … could I now sue that employer 40 years later for any heart disease that had appeared in any family members who were required or coerced to follow my employer’s “wellness” requirements of the day? Their business liability underwriters haven’t thought this through carefully enough yet. I say “hit ’em where they’ll feel it” — in the “liability pocket.” They’ll be jumping off the wellness bandwagon in droves. It has been proven more than once that people who smoke do in fact die sooner than those who don’t. Many people in Plus Sizes that don’t smoke often live longer than a person of any size who does smoke. We obvioulsy have an extremely inhumane “Big Brother” mechanism governing and managing our society on many levels. If we allow them to continue,we’ll destroy ourselves sooner than anyone could ever imagine. I can’t believe the gross negligence as well as the inhumanity of insurance companies, employers and our government that allow so many infractions to be put upon a person’s human rights. This defiling of human/humane rights against people simply because of their body size is outrageous! In 1887, Lord Acton said, “Power tends to corrupt and absolute power corrupts absolutely.” There is no argument in my mind that if governments and corporations are put in charge of my health decisions, the result will not be in my best interest. NYC’s Mayor Bloomberg famously wants a punitive tax on large sugared drinks. I am no champion of those beverages, but why should Bloomberg, his fatphobic health commissioner, or anyone else tell someone how they should eat? A NY Times survey has just showed that 60% of New Yorkers are opposed to such a tax. We’re only one step away from your employer monitoring how many hours you sleep, and penalizing you for not being sufficiently refreshed when you arrive at work. How about penalizing those who make the sugery confections and offer them to the public? Maybe the same for the tobacco companies. Are they offering addicting products without a license? There are hundreds of ways to look at this problem, and I fear none of them are very effective, lucrative, or desirable to all parties involved. Sigh. We have free agency and sometimes dealing with our decisions will not make everyone happy–or in this instance–healthy. Good luck on your quest. The real irony is that people actually want to be healthy! If they don’t do the things the experts say will make them healthy, It’s either because some other problem is preventing them from doing so, or deep down inside, they don’t believe what the experts say. Health advice in the past has proven to be wrong, so there’s no reason to believe what we are being told now. There is no need to provide incentives for things people already want. If employers want healthy employees, they need to provide opportunities rather than incentives. Stress is an important factor in illness, so show me the employer who makes an effort to reduce employee stress! That’s the one who will have healthier employees.